American University of Sharjah (AUS) has joined an elite group of universities who have achieved Bloomberg Experiential Learning Partner Program (ELP) status. AUS is one of only 35 universities worldwide, and the first in the MENA region, to be awarded the prestigious accolade. The program is designed by Bloomberg to recognize and celebrate universities who are leaders in experiential learning. Through the program, Bloomberg is building an international community of peer institutions and academics who are forerunners in providing innovative financial education. To become an Experiential Learning Partner, universities must integrate Bloomberg courses into their curricula, and have at least 100 students complete Bloomberg Markets Certification each year. 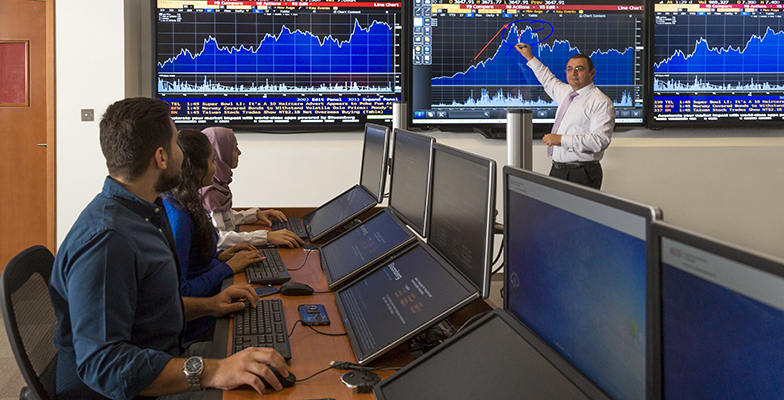 Students of AUS’ School of Business Administration (SBA) have access to 22 Bloomberg Terminals in the SBA Interactive Trading Floor (ITF), which was financed by HSBC, allowing students real-time access to Bloomberg’s global network of financial data, market and economic news, and financial software. The ITF has also been used by industry, with the Sharjah Finance Ministry and Sharjah Asset Management and Securities and Commodities Authority both undertaking training in the facility. The ITF also prepares SBA students well for future careers in the finance industry. SBA graduates regularly go onto employment in leading international firms, with the skills and knowledge necessary to immediately contribute value in their new roles. The awarding of ELP status builds upon SBA’s long list of impressive honors, including accreditation by the prestigious Association to Advance Collegiate Schools of Business (AACSB International). Less than five percent of business schools worldwide have achieved this distinction. SBA has also been named by U.S News University Rankings as the best business school in the Arab World (2016). For more information, please visit www.aus.edu/sba.